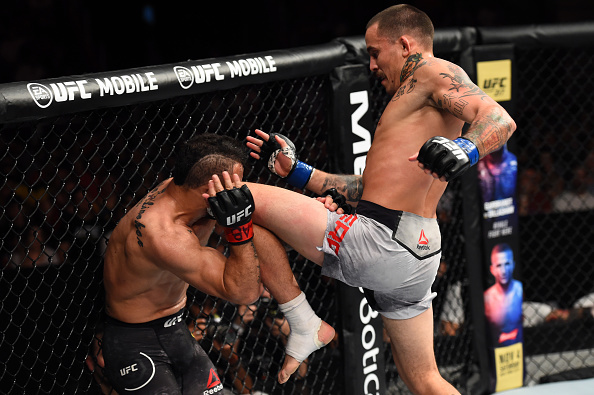 By all accounts, Marlon Vera had a pretty good year in 2017, going 2-1 with a pair of finishes over Brad Pickett and Brian Kelleher before losing a decision to John Lineker in October. He would agree. Tomorrow night, Vera will be in Belem, fighting for the second consecutive time in Brazil as he faces Douglas Silva de Andrade. It’s his eighth trip to the Octagon, which makes his 2017 run even more impressive, because as a native of Ecuador, he came up a lot harder than most of his peers when it comes to the world of mixed martial arts. Now in California, where he has been training with the Team Oyama crew, Vera has seen the evolution of his fight game. And he’s become a beacon of light for fighters back home that hope to one day follow in his footsteps and get to the UFC. Yet while leaving home to chase those dreams is part of Vera’s story, the most important part was learned back home in Chone. He’s made his parents proud, with dad making it to a few fights, but mom…well, that’s a work in progress. What’s not to like with Vera, an honest fighter who always shows up to win. And in 2018, his goals are clear.